EMSI is excited to host an S420 Command and General Staff course (or ICS-420 Advanced IMT) on May 13-16 in Front Royal, Virginia. Limited seats remain in this seldom offered, advanced ICS course. Specifically, vacancies remain in Command Staff positions (Liaison, Public Information, and Safety). Designed to prepare students to function effectively in the position of an Incident Commander (ICT2) or Command and General Staff during a Type 2 response, the focus of this course is on the application of previously acquired knowledge, skills, and experience at the Type 3 level, with particular emphasis on team interactions in a Type 2 incident management environment. Performing the duties and responsibilities of their respective positions as IMT members on a Type 2 incident, students will participate in two types of groups (teams and similar position) during exercises. 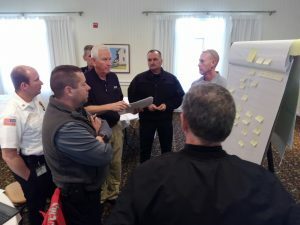 These exercises include a simulation of the mobilization, management, and demobilization phases of a rapidly accelerating Type 2 incident that has potential to become a Type 1 incident. Students will learn to function as an effective IMT member at the Type 2 level and will be prepared to advance their Command or General Staff qualification to the Type 2 level. Interested students should have a Type 3 ICS qualification in a Command or General Staff position, along with sufficient experience at the Type 3 level to prepare for advancement towards a Type 2 qualification. For more information, including pricing for individual seats, please contact EMSI. EMSI is a global leader in the training and application of ICS. We provide advanced ICS position-specific and IMT training, leveraging our team of highly qualified and experienced Type 1 ICS practitioners. EMSI team members have responded to and managed some of the most complex incidents of the twenty first century, including wildland fire, natural disaster, oil and hazardous materials, law enforcement and security, and other all-hazards incidents and events. We leverage this real-world experience to provide superior training experiences for our clients.